Possibilities of improving the technical-and-economic indices of using evaporative cooling of steel melting furnaces are discussed. 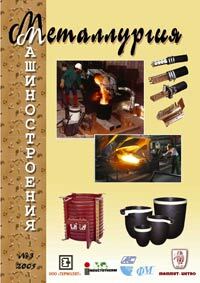 Characteristics of furnaces with a capacity of 10 to 180 t are given. The work investigates a method of continuous calculated determination of the liquid steel temperature in steel melting arc furnaces. The effectiveness of the method allows using it on all industrial electric arc furnaces. It has been ascertained that thermodynamically non-equilibrium structure is formed in the liquid melt of synthetic iron. During its long-continued isothermal curing the structure of melt deviates from its equilibrium condition extremely: it is continuously increasing within 120 min and then starts to decrease. This research suggests probable physicochemical mechanism of structure formation which determines the known behavior of synthetic iron as well as its instability. A thermodynamic concept and the characteristic features of melt structure near the phase transformation temperature have been set forth. It is shown that the crystalline structure reflects the melt structure. By controlling the melt structure near the phase transformation temperature one can effectively influence the formation of crystalline structure of a cast product. Based on the data of metallographic investigation, two stages of eutectic crystallization - kinetic and diffusion - are discussed. The shape of graphite crystals formed in the kinetic stage is determined by the growth processes whose anisotropy is related to the laminar character of the graphite crystal lattice. Effect of the diffusion stage and change of the aggregative state of graphite's partner in eutectic has been evaluated. Contribution of both stages to the formation of flaky, vermicular and nodular graphite has been analyzed. The possibility of using friction welding with a rotating rod for repairing casting defects has been shown. The main process variables for casting Al alloys allow increasing the ultimate strength up to the level of values of the base metal in an artificially aged state. Yeryomin Y.N. et al. The Electroslag Process of Making Tube Junctions The work investigates the properties of metal that is made by the method of centrifugal electroslag casting. The advantages of making various products using this process over other methods are shown.